You will know that you have received the update on your account when you open up weather in the launcher and see a panel asking if you want to add it to your Home screen. Once you tap Add button, you will have a sunshine looking icon added to your Home screen which you can treat like any other app shortcut. That is, you can put it in a folder, move it to different pages on your Home screen and the like. Tapping the icon will take you to the weather page to get current conditions, forecasts and so forth. By default it will take you to your current location’s weather information but if you want to search for another city, just enter that city’s name into the search bar and you’ll get that information. If you haven’t checked out the new weather information in Google Now, it is pretty impressive in the details it provides. By default in Google Now, you will get the weather information for the day including the high and low temperatures and current conditions. You can then use the down arrow at the bottom of the sheet to open up the full page and get a wealth of information. First, you can get the weather information for tomorrow and a 10 day forecast by using the tabs at the top of the sheet. This page will change in color and the graphics shown based on the conditions outside. Second, if you scroll down, you can get information like the Dew Point, atmospheric pressure, UV index and visibility. Below that you will find an air quality meter and finally a sunrise & sunset graphic that lets you know the sunrise, sunset and hours of sunlight you will get today. 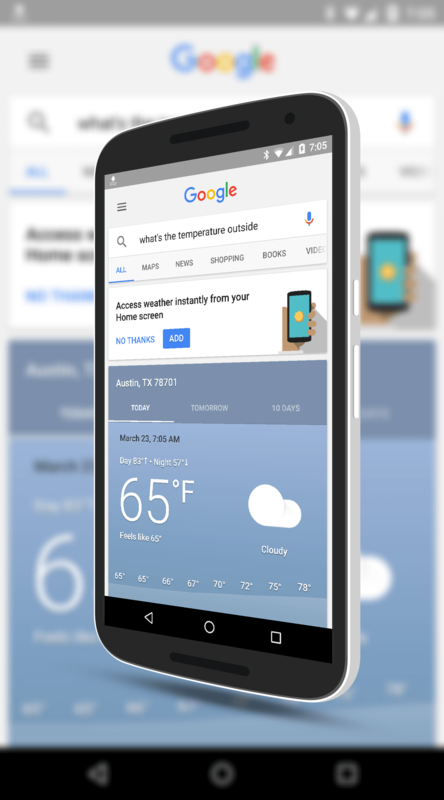 While the weather in Google Now won’t necessarily replace a weather app like AccuWeather or The Weather Channel app, it does give you a quick way to access weather information while you are on-the-go. There is no update to the Google Now Launcher required for this update. It is on the back end at Google.